Note: The opinions expressed in this Toronto Injury Lawyer Blog post exclude the Blue Jays, Rock, and Argonauts. It’s mainly limited to the Maple Leafs, TFC and the Raptors. Ever notice how utterly crappy Toronto pro sports franchises are? When’s the last time Toronto had a major sports title? The Jays won a World Series Championship back in 1993. We hope they’re grab another one very soon with a fresh looking team. I use words like brain injured; train wreck and car crash (which are synonymous with personal injury law) to describe the professional Toronto sports scene because it’s exactly that. The Leafs haven’t won a championship since 1967. The year the Leafs last won the Cup, the NHL only had 6 teams!!! That means they had a 1 in 6 chance of winning it from the very beginning. I like those odds. The following season, the NHL expanded to 12 teams, and so began the catastrophic car accident that was, and now is the Toronto Maple Leafs. Nobody every points out that the Leafs were only ever able to properly compete for a Stanley Cup when the league had just 6 teams. Does a 6 team league even constitute healthy competition. You play the same 5 teams all the time. How hard did those scouting departments have to work? Staying with the hockey theme, today the Leafs fired general manager Brian Burke. The organization named Mr. Burke’s right hand man, Dave Nonis as his replacement. Burke and Nonis have been working together for a long time. Basically, the upper brass replaced one man for another man, both with the same training, experience and hockey vision. They are basically same person (self admitted); save for their personalities which contrast. One is more brash, the other is more patient and soft spoken. This is hardly a paradigm shift. It was a business decision, not a hockey decision. Toronto’s management didn’t interview any other candidates. They offered Nonis the job the same day they fired Burke. Nonis didn’t have any time to consider the offer (not that he would). Burke stays on as a senior consultant to the organization, leaving room for him to continue to pedal his influence. If Burke were really the problem, why not let him go entirely? Doesn’t make much sense. What made me laugh even harder, was that the guy who introduced Dave Nonis as the new GM was Tom Anselmi. 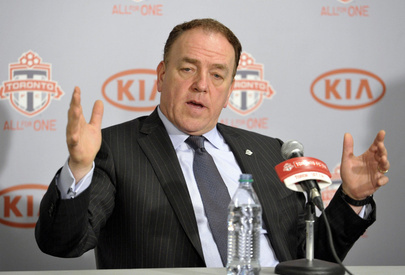 Anselmi was responsible for TFC’s management; a franchise which has never made the playoffs in its history. Talk about the blind leading the blind! Let’s move to Toronto’s soccer team. Since it’s inception in 2006, Toronto FC has never made the playoffs. In their 6 seasons, they’ve had 8 head coaches! That’s 1.33 coaches per season! The new head coach, has zero coaching experience. That’s not so bad, but what is bad is that he remains under contract with Queens Park Rangers (one of the worst soccer clubs in the English Premier League) and unless he gets out of that contract, he will not be able to join the club to practice with them until the MLS season is already underway. It would seem that if you’re hiring a new coach to implement a new system, who has to learn a new league, new opponents and new players; that it would be pretty important for that coach to eat, sleep and live TFC soccer and not be playing in England. Tack that decision up to TFC’s poor management displaying a loss of concentration, poor decision making, incapacity etc. All of these symptoms are synonymous with brain injury . Brain Injured clients at Goldfinger Injury Lawyers display these symptoms every day. They have to work with occupational therapists, social workers, speech language pathologists, rehab coaches, neurologists and psychologists to deal with these injuries. I’m no doctor, but I recommend that management at Toronto FC get their heads checked for brain injury. I know a good lawyer! Last, but not least, and my personal favourite are my beloved (or hated) Toronto Raptors. For anyone who knows me, I’m a big basketball fan, and have been my whole life. When the NBA was coming to Ontario I was extatic. I now had the chance to see stars like Patrick Ewing, Michael Jordan, Karl Malone, Kobe Bryant and Shaqulle O’Neil in person. I even had hope that one day, the Raptors might even hoist the Larry O’Brien Trophy! But that was all a dream. The reality is that the Raptors are one of the most poorly run basketball franchises in the world. Yes, in the world. The Raptors haven’t made the playoffs since 2003-04. We’re approaching 10 years of futility, in a woeful Eastern Conference where even when you lose games, you still move up in the standings. The reason I say that the Raptors are the worst managed pro basketball team in the WORLD amounts to the fact that they act like they’re a small market team with small market dollars; when in fact they’re a LARGE market team with a billion dollar conglomerate supporting their every move. Even worse is the fact that that the Raptors compete in the NBA, but every season they make their team to compete in the Euro League. I have no doubt this team would win a Euro League title every season. But they compete in the NBA, with NBA refs, rules and an NBA style of play. They haven’t seemed to appreciate that over the past 10 years. Failing to identify with reality is called delusion. When people are delusional, the Court requires that any settlement between an accident victim and an insurance company get approved. This is called Court Approval of a Settlement for a Party Under Disability, and it’s provided for under the Rules of Civil Procedure, and under sections 6 and 45 of the Substitute Decisions Act, 1992. If I were the lawyer for the Raptors, I would ask that a Guardian be appointed for Bryan Collangelo and eveyone else in the Raptors organization because I think they lack capacity to properly appreciate the consequences of making a decision, or lack thereof. Plain and simple, they don’t know what they’re doing and they need somebody with a sense of reality to take the reigns. Sound very familiar traumatically injured accident victims and their families folloiwing a serious accident. All three of these organizations are run by Maple Leaf Sports and Entertainment. MLSE isn’t known for winning championships. They’re known for making money. If Toronto sports fans want to win a championship, they should start cheering for a team which isn’t run by MLSE. When sports franchises are run by one owner, or one crazed group which isn’t so concerned about the bottom line, they will win championships. Winning = $$$ If any of Toronto’s pro sports teams were located in smaller markets, saw like Miliwaukee; they’d go bankrupt. At some point in time, you need to win games, or else, you’re a train wreck which is what us personal injury lawyers deal with best.